HoHO! Greetings once again, truthseekers! Purple Ninja is dismayed to report that you have disappointed the Purple Ninja. There are some among your number who have failed to pledge their support to the The Gamers: Dorkness Rising (Formerly Pizzajitsu: The Motion Picture) Blu-ray Kickstarter campaign. You claim to be loyal students of the Purple Ninja, but Purple Ninja has been in your home. Purple Ninja has flipped through your filthy, shameful browser history, and has obtained proof of your lack of support. This will not stand. It is not too late to avoid the oncoming whirlwind of vicious, violet violence. Go! Pledge and be spared! I’m really scared. I’m only ten years old but I had to run away from home because whenever I get angry things start blowing up. The police thought I was some sort of crazy person. And now there are these people in black coats and sunglasses following me. Please help me! Oh boy! Okay, we’re doing this. Have a seat, Deven-san. 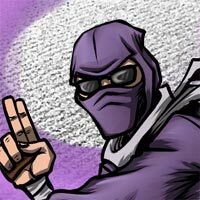 It is time for Purple Ninja to give you “the talk”. There comes a time in a young boy’s life when his body begins to change. Growth spurts. Hair in weird places. Angersplosions. This is all perfectly normal. Well, not the last one. That one is pretty uncommon. The technical term is “pyrokinesis” and it means that you have developed the psychic ability to set fires with your mind. Congratulations! Pyrokinesis is one of the more useful psychic powers. Even if you do not devote your life to the fight against Evil—which would be a huge mistake in Purple Ninja’s opinion—you’ll find your pyrokinesis coming in handy on a day to day basis. Just think of the possibilities! Clearing dry brush from your yard with a wave of your hand. Lighting the barbecue with a smoldering glance. And s’mores, like, whenever! Just *BAM* insta-roasted marshmallow! Oh, man, Purple Ninja loves s’mores! And as for these black-coated strangers, the answer has been inside you all along, Deven-san. Light the stalkery creepsters up! HoHO! 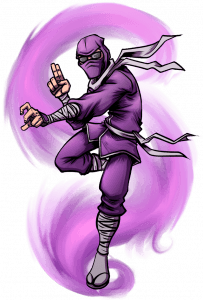 The Purple Ninja is the greatest Demon Hunter of them all, master of the Seven Essential Forms of Martial Arts, and RIGHT BEHIND YOU! Haha! (HoHO!) Purple Ninja made you look! “Light the stalkery creepsters up”?